Animal connections are vital for people gaining peace within our chaotic society. Your Snake session is private One-on-One time. Learn about them, interact or let them 'massage' you into deep sensory bliss! Entwine in interspecies love to remember your wild divine nature. Even better... Share the Thrills & AWE-someness! Click ∞ HERE ∞ to get yours today! Gift Certificates available. Choose your Location when you purchase. Payment required in full prior to the session. Venues/Dates: Upon purchase, you will receive an email with confirmation and details. 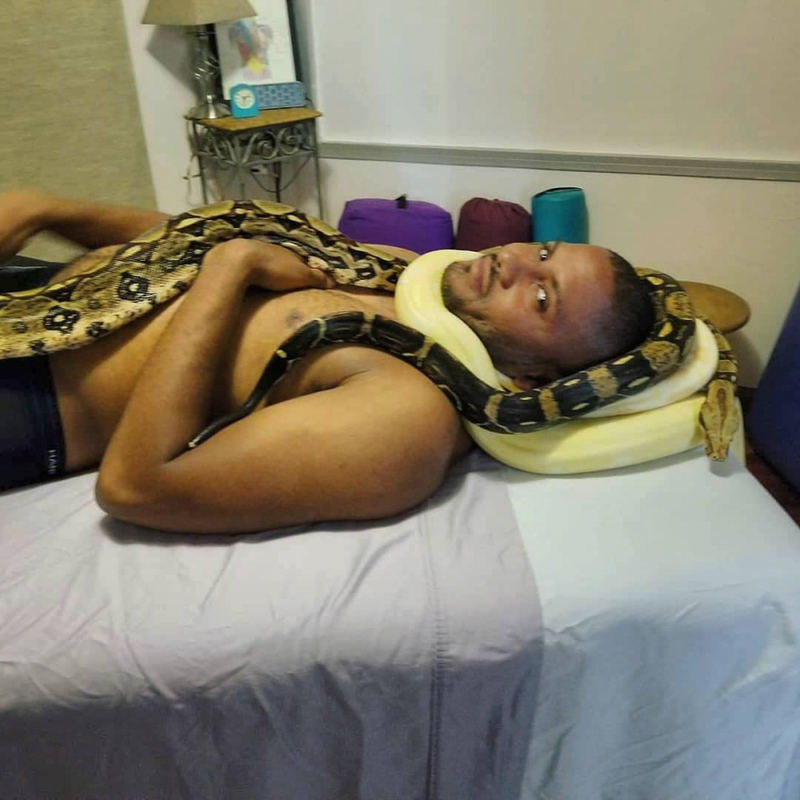 ◊ What is a Snake Massage? 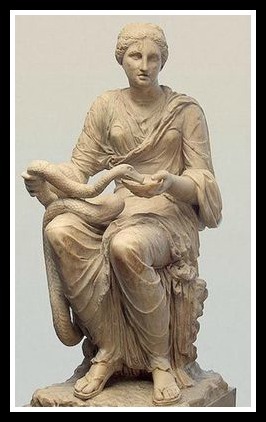 Back in the 5th c. BCE, the practice of Snake healing was held in a small dark chamber/cave on a hard bed, with Asklepios and/or Hygieia in their theriomorphic (animal) form of an actual live Snake. Today, the sensation of the Serpent on the human body still elicits a thrill and relaxation--- on a comfortable massage table! Stella Maxwell with snakes Oracle, Psyche and Fate. ◊ Is a Snake Massage safe? 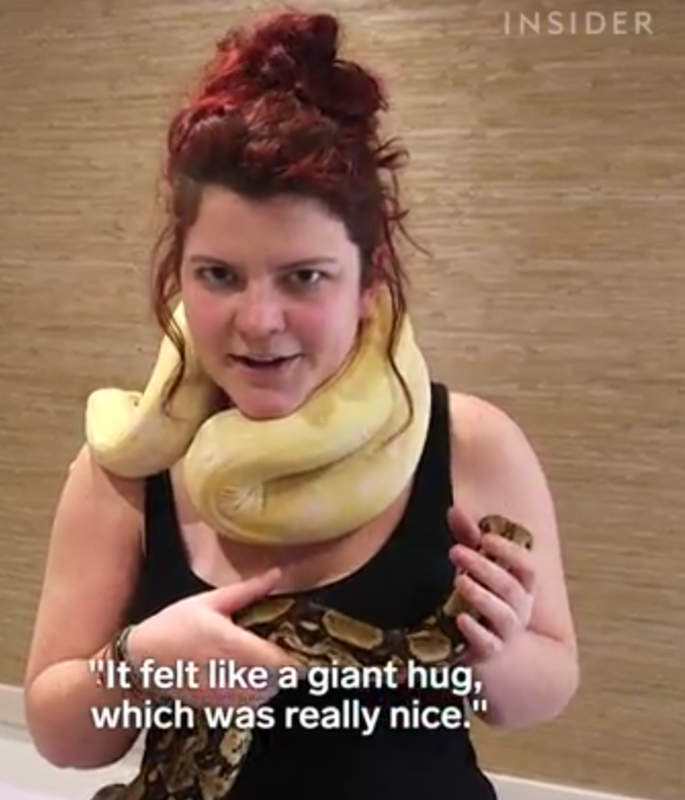 A Snake Massage is a thrilling dive into deep sensory bliss. How you feel afterward is directly related to your emotions at the start. Your transformation is guided by me, Serpentessa, enabling you to move past your natural initial reactions of fear or stress to empowerment, relaxation, and bliss. When you understand your reactions as a form of energy informing you and you consciously respond differently, you transform that energy. Your new accessible responses are rewired into the neural pathways of your brain and anchored in via a high state of emotional arousal, resulting in unforgettable highly valued memories in your life. It’s always your choice. An orientation is provided for newcomers to explain snake behaviors and answer any and all questions. 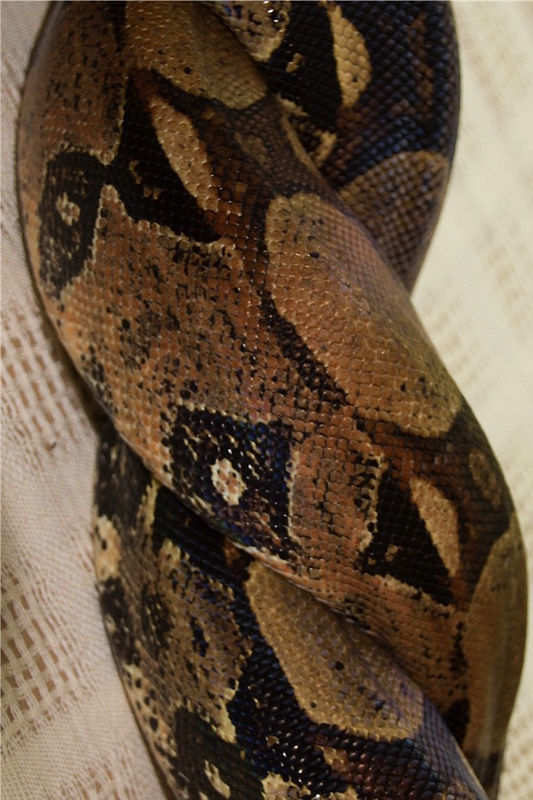 On the table, the boa constrictors’ soothing undulations dispel any fears or concerns by toning and stimulating your body’s vagus nerve, releasing endorphins and oxytocin. These feel-good hormones relieve stress, create pleasure, and increase your emotional, physical and cognitive resiliencies in today's stressful world. Learn about the Snakes here. ◊ Why would I want this? People come to be 'massaged' or entwined in Snakes for many different reasons: stress relief, illness, migraines, fibromyalgia, spiritual reasons, nature deficit disorder, vagal toning, and enjoyment. Neurodiverse folks considered to be on the spectrums of ADHD and autism have actively sought out one-on-one time with Snakes. Animal connections are a vital contribution for people finding their peace within our chaotic society. Numerous scientific studies confirm the power of healing touch. The sensation of Snake on the Human body elicits thrills and relaxation. Their healing touch releases endorphins and oxytocin, the feel-good hormones that relieve stress, create pleasure and support you in rejuvenating your body, mind, and soul in today's stressful world. Not only do the Serpents elicit emotional/ psychological stress relief, but blood flow is increased to tense areas and the gliding weight of the Snake's body relieves pressure throughout the person's body. 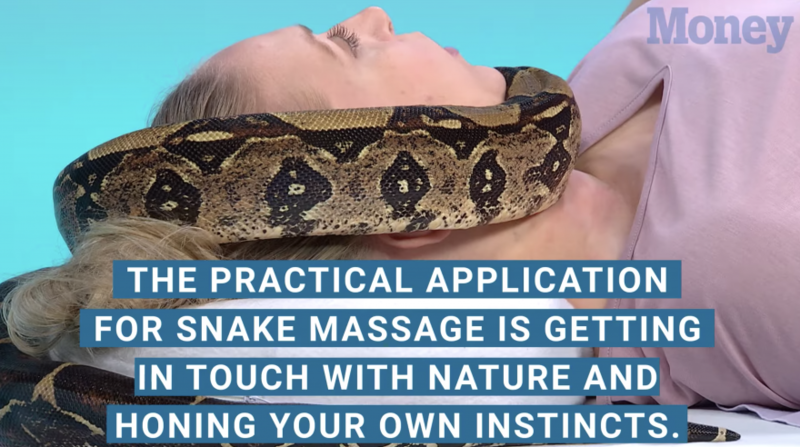 Click ∞ HERE ∞ for your Snake Massages! (Due to privacy preferences, Testimonies & Images may not be related throughout website. But each has been offered freely to share publicly). Click ∞ HERE ∞ to get yours today! 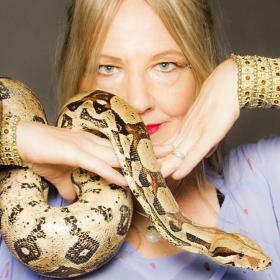 The healing energy of Snakes has been accessed by many cultures worldwide. 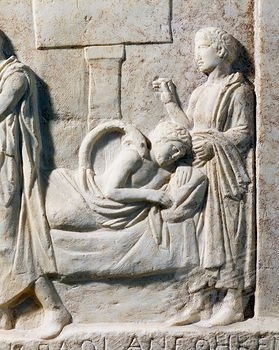 Asklepios, the Greek god of healing and his daughter Hygieia, (seen here) remains the most documented Snake healing practice, dating to 5th century BCE. Over 320 sanctuaries have been recovered with inscribed stones detailing the healing dreams invoked by the Snakes. 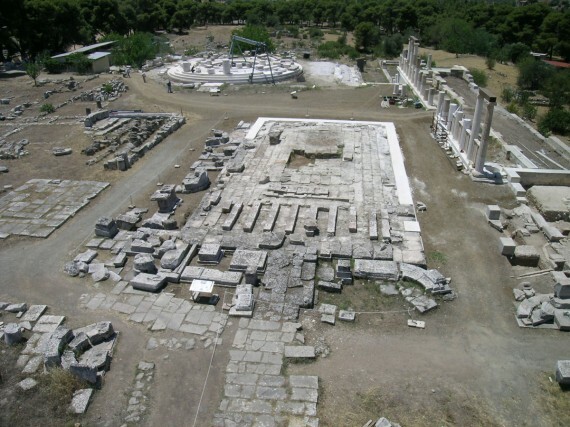 This is Epidauros, the largest sanctuary to date, and now a World heritage site. 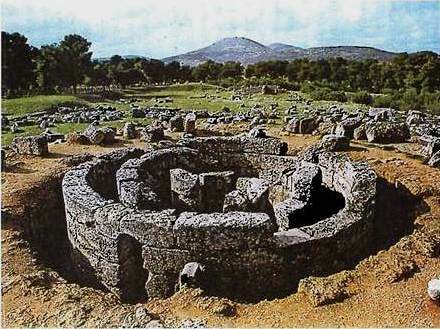 Essentially, people in need of healing crawled into the abaton, a small dark chamber or cave with the Snake priest or priestess and stayed there until they were visited by the healing god or goddess in its theriomorphic form (animal form) of an actual live Snake. Entering the abaton dream chamber was an archetypal form of descent into the personal and collective unconscious, a visit into Earth Mother's tomb and womb where Death into Rebirth occurs. The living yet archetypal image of the Serpent as the spiraling DNA of cellular intelligence creates access to the archetype of transformation in the realm of dream or the collective unconscious. Healing occurred as the supplicant implemented the dreams of deep body wisdom into waking conscious life. 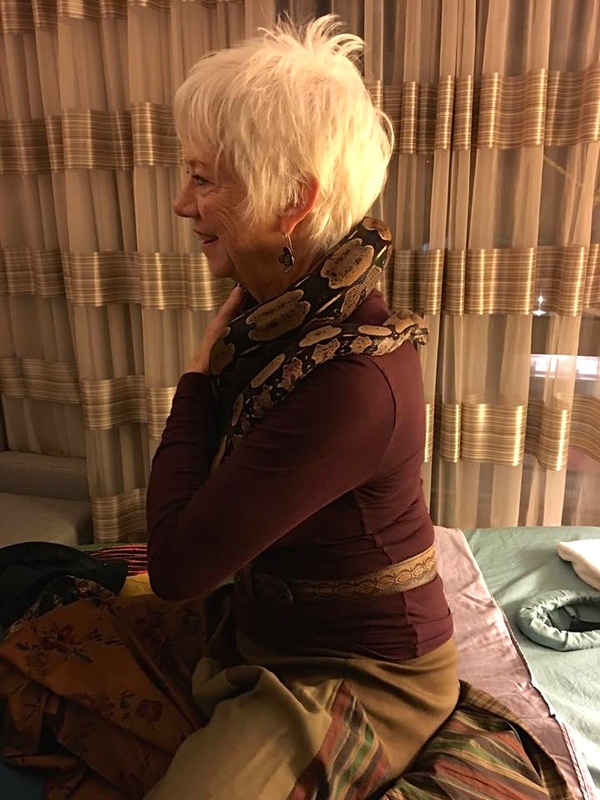 Excerpts and verbal testimonies of healing with Snakesss are included in the Snake Wisdom chapter of Serpentessa's Dvd: Belly Dance w Snakes: Embody Your Inner Serpent.